Los Angeles, United States– July 4, 2018 - Graphixly LLC & Celsys, Inc. today announced a partnership to enhance the distribution of Clip Studio Paint in North America, South America and Europe. Clip Studio Paint, the leading comic and manga creation software worldwide developed by Celsys, Inc., is the all-in-one solution for stunning, ready-to-publish illustrations, comics, manga and animations. Anime Expo attendees can visit Graphixly at the Wacom booth in the Entertainment Hall 8C and learn more about Clip Studio Paint and take advantage of an exclusive special discount towards their purchase of Clip Studio Paint. "We want to provide artists and fans around the world the tools to unleash their creativity," said Fahim Niaz, Founder of Graphixly. "In partnering with Celsys, we are able to distribute packaged versions, in addition to the already available download versions, of Clip Studio Paint to English, French, German and Spanish speaking users. As well, we'll be able to provide new artists and the creative industries with a one-of-a-kind drawing, illustration, painting, comic and manga creation tool." With a PRO version targeted towards general artists and illustrators and an EX version geared towards comic and manga creators, Clip Studio Paint provides a powerful solution for artists of any caliber to create their own unique masterpieces. Artists can invigorate their artwork using realistic feeling sketching pencils and inking pens, fully customizable brushes and raster and vector colors. Other features include, focus and speed lines, screen tones, comic panel creation, rulers, built-in word balloons and over 10,000 content materials to enhance any artwork. Furthermore, both versions have the capacity to create animation and the EX version is currently being utilized by many studios in Japan’s animation industry. "Clip Studio Paint is a great tool for illustrators and manga creators of all skill levels," said Tetsuya Kobayashi, Celsys' Director of Marketing. "Our goal with the Graphixly partnership will be to reach new audiences and take advantage of new opportunities." 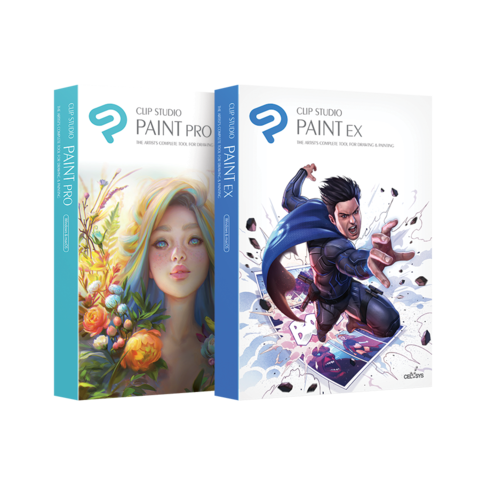 To commemorate this new partnership, the Clip Studio Paint PRO and Clip Studio Paint EX physical packaging artwork has been redesigned for the North American, South American and European markets. The new English packaged versions of Clip Studio Paint PRO and Clip Studio Paint EX are available for immediate purchase from Graphixly. For more detailed product, pricing and upgrade information visit the Graphixly website.